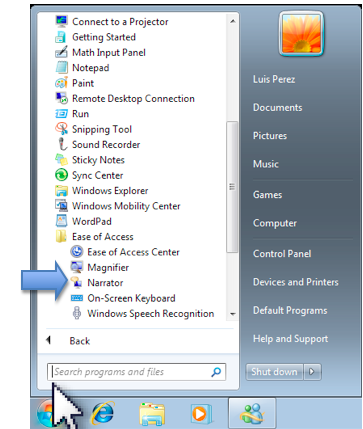 Windows 7 includes Narrator, a basic screen reader that can read the information on the screen for people who are visually impaired. Choose Start, All Programs, Accessories, Ease of Access, Narrator. The Windows 7 Narrator will start reading the information in the current window. To stop Narrator from reading text, press the Control key on your keyboard. Two other useful shortcuts are: Control, Shift, Enter, which will read the currently item (or the item that has keyboard focus) and Control, Shift, Space, which will read the contents of the currently selected window. -Echo User’s Keystrokes: reads back what you type. -Announce System Messages: reads back background events such as system notifications. -Announce Scroll Notifications: will let you know when the screen scrolls. -Start Narrator Minimized: displays Narrator as an icon on the task bar when it starts up, rather than as a window. 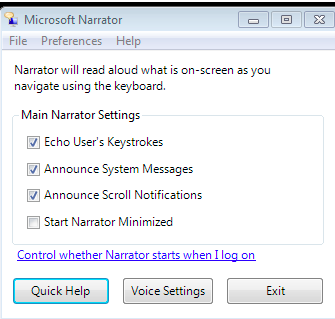 To listen to a tutorial about Narrator, choose Quick Help on the Narrator window. 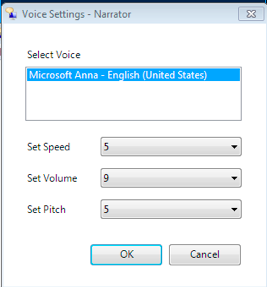 To change the voice settings for Narrator, choose Voice Settings on the Narrator window. This will open a popup window with menus that will let you adjust the speaking rate, pitch and volume. To exit Narrator, click the Exit button on the Narrator window. Narrator will stop reading the information on the screen.